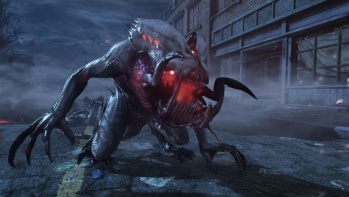 You'll be able to choose between one of four classes in Call of Duty: Ghosts' alien hunting "extinction" mode. The Weapon Specialist focuses on one vital task: destroy as many aliens as possible. The extra bullet damage really comes in handy when dealing with heavily armored threats or when fighting back a swarm of smaller enemies. Weapon handling continues to improve as the Weapon Specialist gains levels. The brute of the group, Tanks stand at the front and take hits that would otherwise knock out other, more fragile classes. The extra health lets you play more aggressively, getting into the thick of things and coming out alive. Additional levels further improve the Tank's health in addition to their lethality. Provide armor for the drill and earn more bonus cash. Without a functioning drill, your team will have a very difficult time progressing. The Engineer offers much needed protection to the team's drill, incredibly useful during moments when you get overwhelmed. Drill maintenance and trap efficiency improve as the Engineer gains levels. When things go wrong - and they will go wrong - the Medic's there to pick up the pieces and get the team back in fighting condition. Fast revivals can mean the difference between success and failure, and an active Medic can help turn the tide of an intense battle. The Medic gains faster movement speed and powerful healing abilities with additional levels. It certainly sounds like Extinction will be a fun little extra game mode to play with friends, when the regular Call of Duty multiplayer grows tiresome.